It’s the first day of our Spring Break Vacation and there are 2 inches of freshly fallen snow on ground. Perfect. Lucky for us we’re headed to sunny Las Vegas later this week, and hopefully the weather will be more sunny and bright. Last week we were teased with 70 degree weather here! That’s Utah for you, if you don’t like the weather, just wait a few days and it will change! Anyway, cold wintery weather calls for warm comfort food and these Chicken Cordon Bleu Pinwheels are just that. They’re savory, cheesy, and sweet with a Honey Mustard Glaze on the top. They are easy to make and my husband is a super big fan. He loves any dish that mixes savory and sweet. Start with Crescent roll dough, you can buy them in sheets now, without the triangles and it’s super convenient for any sandwich creation you can think up. Top the dough with your favorite kind of ham. 12 slices should do it! Next comes the Swiss Cheese. It would be easier to buy it pre-sliced, but I just did manual labor and sliced it myself! Ha ha! Next, top your cheese with chicken slices. I just used 8 because I didn’t want to overload the dough, but I think it could have handled more, just go slow when you roll. Start at one end and gently and tightly roll it up! Arrange your pinwheels in a greased casserole dish. It should make 12 rolls. Melt 3/4 stick of butter in a saucepan, add 2 Tablespoons of spicy brown mustard and 1/4 cup of honey and mix it up! Pour it over the top of your pinwheels and use a pastry brush to spread it into each little crevice! Crush up a cup of croutons in a bag with a rolling pin. My bag was almost empty so I just used the bag they came in. Sprinkle the croutons on the top of your pinwheels. Bread crumbs would work here just fine, but I just like the flavor of the Olive Garden croutons. Bake at 375 for 15-20 minutes, or until the cheese is melted and bubbly and rolls are golden brown. Prepare a 9 x 13 casserole dish with cooking spray, set aside. Top dough and top with ham, cheese, and chicken. Cut 12 pinwheels, about 1- 1/2 inches thick. Place pinwheels in casserole dish. In a small saucepan, melt butter, honey and mustard. Top pinwheels with crushed croutons. Bake for 15-20 minutes, or until bubbly and golden brown on top. Oh my gosh, this looks simply amazing! I love the idea of cutting them into pinwheeels! Thanks for joining us for Thursday Favorite things blog hop. What a delicious idea – and so easy too! Your Chicken Cordon Bleu Pinwheels look fantastic and sound so tasty. Sharing! Thank you for bringing this wonderful recipe to the Hearth and Soul Hop. Hope to 'see' you again this week! 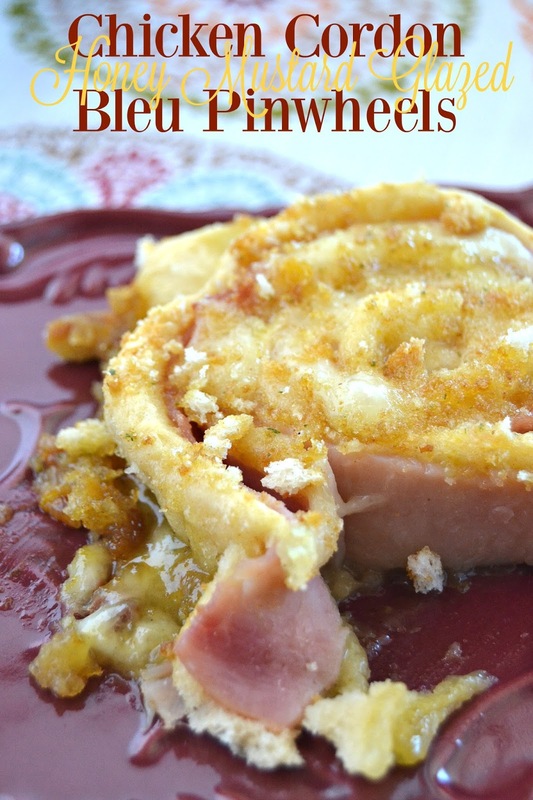 We will just love your great Chicken Cordon Bleu Pinwheels, yum! Thanks so much for sharing with Full Plate Thursday and hope to see you again soon! We happen to meet a great people there and started to chat with them and drink w/them too. I had a great time here, glad we found this place by accident. Will definitely come to this event space again as anyone will make this a regular spot easily.